After receiving an invitation from the Vienna Secession, WochenKlausur decided to develop a project to improve the situation of homeless people, instead of putting on an exhibition. At the time of the project, Karlsplatz, the square in front of the exhibition building, was known throughout the city as a meeting place for homeless people. WochenKlausur customized a van into a mobile clinic that provided Vienna's homeless population with access to health care, free of charge. To pay the salaries of the physicians, WochenKlausur resorted to a trick, asking a correspondent for the German news magazine Der Spiegel to conduct an interview with the councilor of Vienna and pretend that he was interested in reporting on the project. Since the politician did not want to appear in the German press as the cause of the project’s failure, he had no choice but to provide funding for the physicians who would staff the clinic – initially for one year. To provide health care for homeless population and to people without access to healthcare. Since 1993, 600 people per month have received medical care from the clinic. 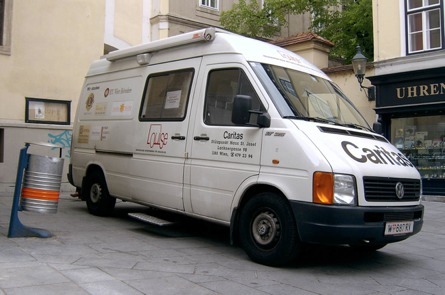 In 1998 a larger vehicle replaced the old van and the relief organization Caritas has taken over management of the entire project. The mobile medical clinic has become a permanent institution, also offering treatment to foreigners without Insurance. If you are in need of free of charge healthcare you can go find the Louise-Bus at these locations: Mon 16.00–19.30: Franz-Josefs Bahnhof, 9. District, Spittelauer Platz; Tue 09.00–12.00: Praterstern - Ladezone BILLA (U-Bahn Exit Nordbahnstraße/Heinestraße) and 15.00–18.00: Behind the Day Center Josefstädterstraße, 8. District, U6 Station Josefstädterstraße; Wed 09.00–11.00: Lacknergasse 96, 18. District, next to the second Gruft and 11.30–14.30 & 19.30–21.30: In front of the Day Center Gruft, Barnabitengasse 14, 6. District; Thu 09.00–12.00: In front of the Day Center at the Main Train Station, 4. District, Wiedner Gürtel 10 and 14.00–18.00: Haus Grangasse, Grangasse 6, 1150 Wien; Fri 09.00–13.00: Behind the Day Center Josefstädterstraße, 8. District, U6 Station Josefstädterstraße and 13.30–15.00: Next to the FrauenWohnZentrum, 2. District, Springergasse 5 - Treatment only for Women. Vienna Secession; sponsors and Council.